Our main problem with traditional dart-shooting Nerf blasters is that once you get hit, there's no real mark or damage done (for obvious reasons). Water pistols, however, do leave a mark, meaning summer-time home or office battles are that little bit more exciting. If you're looking for a new weapon to make your own; one that combines a small size, decent range, and good water capacity, step this way. 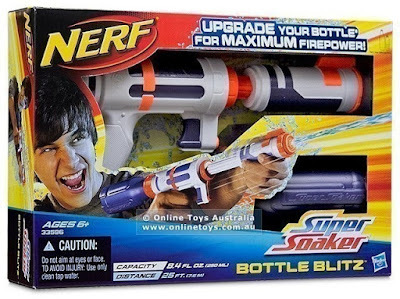 We check out the Nerf Super Soaker Bottle Blitz. As Super Soakers go, the Bottle Blitz is pretty small - far smaller than the last one we reviewed, the Double Drench. Just like that water pistol, the Bottle Blitz works by way of a pump action, not a trigger. You simply pull back on the forward grip and the pressure forces water out. It works great, but we do miss the classic 'pump to build pressure and then shoot' as you did with the classic '90s models. We like the overall look of the toy, and the white, orange and dark blue works well - it looks enough like a Nerf blaster while retaining a solid and rugged body. The grip of the Nerf Super Soaker Bottle Blitz is big enough for an adult to hold, while thin enough for kids as young as three to use (although Hasbro gave it a 6+ rating). What gives this water-weapon its unique name is the fact that it has a very open design. The included water bottle just sticks out of the back, and because Hasbro have used a traditional bottle screw attachment, you can swap out that 250ml bottle for a drinks bottle. We hooked up an empty (and clean) 2 litre Coke bottle, which certainly increased the play time... but made the bloody quite heavy and unevenly balanced. 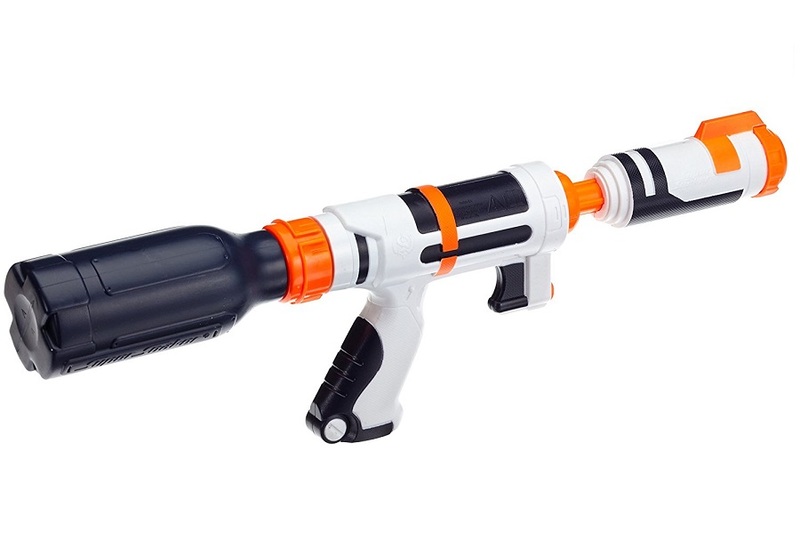 That was the only issue with swapping the water reservoir - the bigger you go the more difficult the Nerf Super Soaker Bottle Blitz is to wield, especially for smaller kids. We'd recommend using the smaller 500ml drinks bottles (raid your recycling) as that keeps the water pistol light, while extending the fun. Due to the way it operates, the harder you pull back on that plunger, the further the water will shoot. As grown up guys we managed a fairly average seven to eight metres, while the kid testers managed only about four metres. There can be quite a lot of resistance behind that plunger, so consider the strength of your kids before buying for them. Right now, however, the Nerf Super Soaker Bottle Blitz is cheap as chips and totally worth a purchase (or two). Water pistols will always go down well during a hot summer, but one that has been carefully designed to maximise on range and capacity is rare. We heartily recommend it.